This clip from Tim and Eric’s Awesome Show, Great Job! made me laugh enough that I thought should include it here. John C. Reilly plays Steve Brule, a dimwitted recurring character on the show. For some reason, I spent some time last night searching the YouTubes for comedians being heckled. I doubt if I would be able to stand up in front of people telling jokes. Add a heckler to the crowd and I would be reduced to a pile of weeping goo. I’m interested in how different comedians respond to hecklers, who are for the most part producers of noise cancer. Many moons ago, before the days when I would compulsively check my visitor stats for my blog in SiteMeter, I would compulsively check the statistics for my website, Splotchy.com. 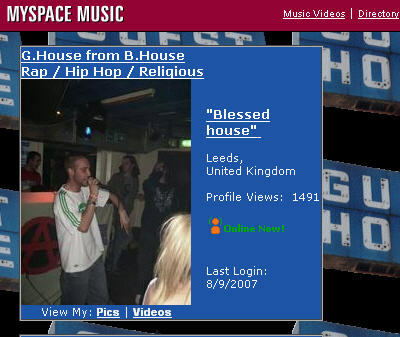 This website has not been updated by me in years, and these days I rarely check the stats there. But, one recent day I thought I’d check them out. 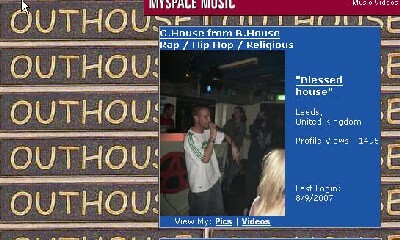 The hits were coming from a MySpace page of self-proclaimed hip-hop, religious rapper G. House. It turns out that he is using this image of mine as wallpaper for his site. Now, when you’re putting images on your site that you yourself are not hosting, you could find yourself at the mercy of the person who *is* hosting the image. Why it was just earlier this year that John McCain fell victim to an image-swapping prank. So here, I’m looking for suggestions. I was thinking about doing an image switcheroo — uploading a new image to my website to replace the above “Guest House” image. Nothing too terribly mean, just something mischievous. What do you think would be a nice wallpaper for Mr. G. House? Okay, I uploaded Flannery Alden’s suggestion in her comment to my website. May the hip-hop God have mercy on my soul. Posted in comedy, geek, myspace. One of the finer moments of The Kids In The Hall. Something to counteract the negativity of my “He Better Be Dead” post. If gorilla-on-gorilla violence can be considered positive.